are quite indicative of how extremely worried the g.o.p. are of beto. cruz is shaking in his boots. LOL.............. shhhhhhh.......... let them seethe. It's fun to watch. What does the KU rwnj's think about Trump taking funds from FEMA and use those monies with ICE to separate families? Yes, admins do that all the time....In this case it just seems like good KARMA to illustrate how Trump looks. Are we great yet? I throw the best paper towel rolls ever. Nobody in history has thrown paper towel rolls like me. Trump took $10million out of a $15billion annual FEMA budget to facilitate ICE initiatives that do NOT include separating families. Do the math. It's less than 1% of FEMA's annual budget. Another much ado about nothing talking point. Included in the 200 million from other agencies. I actually did not mean her views are extreme. I meant the negative, unrelenting political hate that a handful of people here constantly spew, ruining the site for everyone else. Some of you don't care about anything but the FIGHT, the vitriol and divisiveness. You thrive on it. It's ugly. And that would be what balance is, JA. You also discuss in an intelligent manner, are articulate and I'm hoping, cute. Out of touch again. 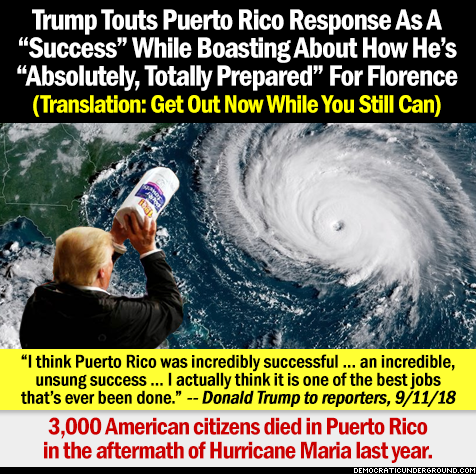 The US may have done all they could for PR. But "Successful"? Just ask my friends living there and those who have family here about how successful they were. I think my new approach to politics is going to be just to criticize whoever is in office from now on...whether I voted for them or not. but you gotta keep up!! Maybe you can't, but I won't hold it against you. Just so you guys know....."Houlton stated that the funds did not come from disaster relief funding, which is a separate pool of money within FEMA, and therefore could not have been used for hurricane response." Sort of makes this thread moot, doesn't it. Sort of makes this thread moot, doesn't it.? No it doesn't, Bestie. Read on. For the last time...I'm not bestie but since you insist I am...Goodbye! The left here has been moot since trump won. Don't give them credence by falling for their claptrap. From the worst offender on here. You extremists are the problem. And your hate? Hate is all they have left. I'd hate to think that these extremists are in any way indicative of Kingwood society. I'd hate to think that these extremists are in any way indicative of Kingwood society. Deplorables aren't extremists? Kingwood has plenty of those.